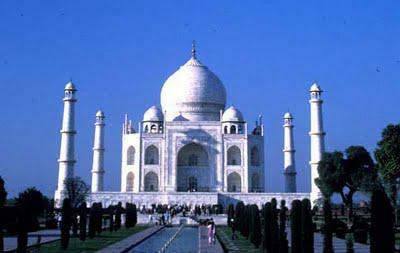 The Taj Mahal in Agra, India, is one of the wonders of the world. Built between 1632 and 1643, the Taj Mahal commemorates the love between Shah Jahan and his wife, Mumtaz Mahal. You can read about the love story that inspired its construction and about how it was built in my book Taj Mahal, co-authored with Madeleine Comora and illustrated by Rahul Bhushan. 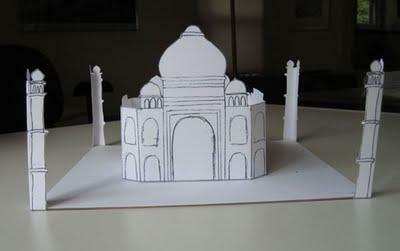 Click here to go to my website and scroll down to Children's Projects to print a pattern and directions to make a model of the Taj Mahal. This project works best if you can print the pattern on heavy paper or cardstock. I visited the Taj Mahal when I went to India in February 2000. Go to my travel blog The Intrepid Tourist and read the post for September 26, 2011, to learn about my trip.